Angus was a goat that lived in northern of Scotland. He lived at a croft with his owners, Mr. and Mrs. MacDougal. Angus loved living in the highlands. Mr. and Mrs. MacDougal gave him food to eat; mostly bits of turnips, potatoes, and a lot of leftover haggis. He also loved to nibble on the thistle, gorse, and bluebells that grew near the croft. Mr. and Mrs. MacDougal treated him well. They brushed his long, shaggy, tan coat, kept his teeth clean and polished his horns. The only thing they ever asked of him was that he never ate the washing that they hung out each day on the clothesline. A nice breeze blew through the glen each day and dried the wash, leaving it with a fresh scent. Mr. MacDougal loved his kilt to smell nice and fresh. He wore it every single day. It was full of red, blue, and green wool, woven into a lovely kilt. Mr. MacDougal also played the bagpipes. Angus would much away on prickly purple thistle and listen to the bagpipes humming. Sometimes he would tap his foot and other times he’d nod his head back and forth. Other times he’d even baa along with the music. One day Mrs. MacDougal hung out Mr. MacDougal’s kilt on wash line, along with his woolen socks and then the two of them walked down the path at the side of the burn, heading towards the castle on the hill. They’d been invited for lunch by a neighbor, Jamie Campbell. Angus found himself alone at the croft. They never bothered tying him up because he never wandered away. After they’d been gone a while it began to cloud over. Thunder began to boom and lightning flashed. It began to rain. Angus clomped over the stones and took shelter under the roof of the croft, next to the clothesline. He stood watching as the rain pelted down on Mr. MacDougal’s kilt and socks. Angus wanted to help so he went to the line and grabbed the socks with his teeth. He tugged until they came off the line. He put them down on the ground near the croft then ran out to the clothesline to get the kilt. Angus stood with the corner of it in his teeth. He tugged and tugged and suddenly a big piece of it ripped right off the kilt. He stood with the torn piece of kilt dangling out of his mouth in the pouring rain. He tasted it. It was wet and soggy but it tasted rather nice. He wondered what it was made of. He swallowed it. Yummy. It tasted delicious! He tore another piece off and ate it, then another, and another, until he’d eaten the whole kilt. "Uh oh," he sighed, as he realized what he’d done. The rain stopped and the sun came out. Angus had to think of a way to explain to Mr. and Mrs. MacDougal, what had happened to the kilt. They would be angry with him. He thought a lot about it. Finally an idea came to him. He’d let them think that the wind blew it away. Yes, that was a good idea. He’d blame it on the wind. Feeling happy with his explanation, he went off to eat another thistle. A while later he saw Mr. and Mrs. MacDougal coming down the path. Mrs. MacDougal had her shawl wrapped tightly around her shoulders and Mr. MacDougal had his hat pulled down over his neck. When they reached the croft, Mrs. MacDougal gave a scream. "Mac!" she called to her husband. "Where’s your kilt?" She looked up and down the wash line and saw the socks on the ground near the house. "What’s this? Your woolen socks are over here!" She picked them up and examined them. Mr. MacDougal said, "It must have been the wind. That’s the only thing it could be. We’ll go and look for it after." Looking around, he said, "Where’s Angus? Angus. Angus. Come home. It’s time for supper," he called. Angus heard Mr. MacDougal calling him and he’d heard them talking about the wash and how the wind blew the kilt away. Feeling safe, he trotted towards the croft. As he arrived, Mrs. MacDougal screamed loudly. "Angus! Angus! You’re tartan!" Mr. MacDougal came running from inside the croft to see what she was screaming about. "Angus. You’re tartan!" he cried out. Both of them stood staring at Angus the goat. Mr. MacDougal lifted Angus’s wool up. "He’s tartan through and through!" Just then Mrs. MacDougal realized what had happened. "Why, Angus, it was you! You ate Mr. MacDougal’s kilt, didn’t you? Naughty goat!" Angus, realizing that he’d been caught, let out a sad little baa. He felt very bad that he’d eaten the kilt, but it had tasted so good. Mr. and Mrs. MacDougal started to laugh. "Now I’ve seen everything," Mr. MacDougal said. 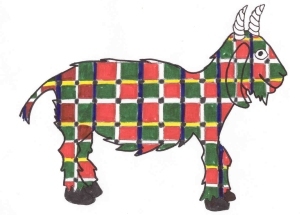 "A tartan goat!" Both of them laughed loudly. Mrs. MacDougal went into the croft and brought out a whole plate of turnip chunks for Angus. "Here you go, lad. Here’s some supper, but from now on, don’t eat Mrs. MacDougal’s washing! Do you understand?" Mr. MacDougal said. He took the plate from his wife and set it on down on the ground for Angus to eat. Angus went baa and ate his turnip. The tartan-colored wool stayed with him for the rest of his life. People would walk up the path to see him and laugh. Mr. and Mrs. MacDougal laughed too. Angus didn’t mind. He was still the happiest tartan goat in the world.